Powerful cleaning agent. It removes construction residues from natural stones, restoring their natural look. It cleans in depth accumulated dirt, salts, mud rain, black spots, mold, as well as oil, coffee, rust and non-cured paint stains. It does not affect the natural look of stones and/or grouts. Its use is necessary prior to waterproofing and/or decorating a surface with varnish. 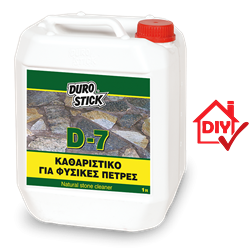 D-7 is used on walls and floors lined with natural stones. Before use, it is recommended to test the cleaner on a small area, particularly for stones sensitive to powerful cleaners (e.g. limestone). It is recommended to use the product 28 days after grouting. Its use is necessary for removing construction residues, prior to the application of waterproofing agents.